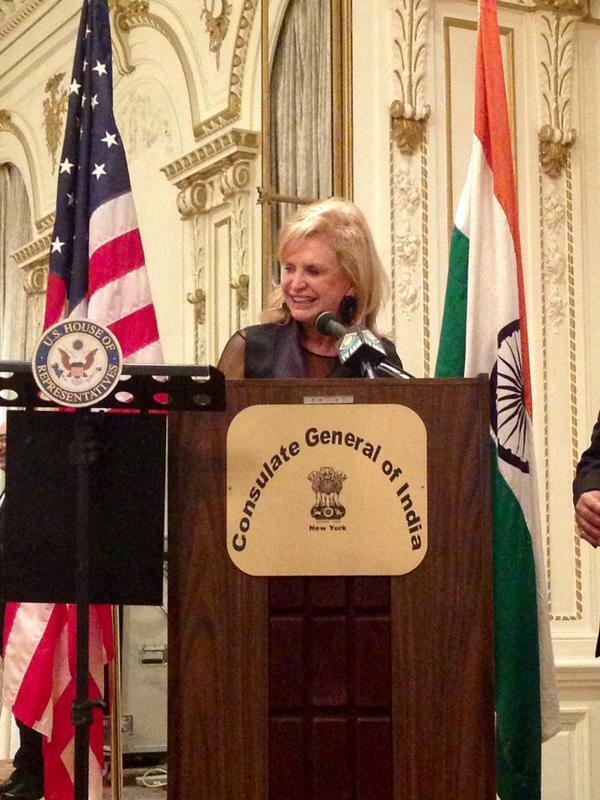 Congresswoman Carolyn Maloney (D) of New York during a recent press conference at the Consulate General of India in New York. Photo courtesy Carolyn Maloney’s twitter page. New York, NY: Though Diwali is celebrated by millions of people in America, and by over a billion people across the globe, the United States Post Service (USPS) still possesses no stamp commemorating the holiday. Why not have a stamp commemorating a major holiday that’s been celebrated at the White House since 2007? Why not grant more recognition to Diwali, especially when there are numerous designs ready to be used? Why not add an easy source of additional revenue into the hands of an ailing organization? A few members of Congress have already begun the push to convince the USPS to begin production of a Diwali stamp: Congresswoman Carolyn Maloney (D) of New York, in a press conference in the Consulate General of India inNew Yorkrecently, implored her colleagues and all Indian-diaspora news outlets to join her in raising awareness for the stamp. Besides various Indian and Diaspora news outlets, many business and community leaders were present. However, rather than a cut and dry Q&A, the press conference functioned as an arena for the exchange of ideas. This is not the first time Maloney has led the fight for the stamp. In 2013, Reps. Carolyn B. Maloney along with Congressmen Ami Bera (D-CA), Grace Meng (D-NY) presented the Deputy Postmaster General, with petitions signed by thousands of supporters of a commemorative stamp honoring Diwali. Maloney is also sponsor, and Reps. Meng and Bera are co-sponsors of House Resolution 47, a resolution which requests that the U.S. Postal Service issue a commemorative U.S. stamp in honor Diwali. Ultimately, at the press conference, Maloney urged the diaspora to contact their Congressman or Senator to demand the inclusion of the stamp. She was supported by Consul General Dnyaneshwar Mulay and Indian community leadersRavi and Ranju Batra, each of whom also spoke at the press conference. Before the memory of Obama’s state visit to India fades into distant memory, it is time to ramp up the effort in introducing the Diwali stamp at home as a sign of stronger ties between American and India. The postal service has issued stamps for Christmas, Hanukkah, Kwanzaa and Eid. Now it’s time for one to honor Diwali. And what’s the best way to join the campaign? Easy: Just write to your congressperson.